We’re deep into the ‘holiday season’ now, making preparations for Christmas. Signs of festivity abound, from carols played on a loop in shops to hyper signs advertising sales to entice deeper spending. As Christians we must fight hard against consumer culture in order to ‘keep Christ in Christmas’. 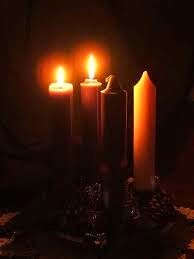 Each Sunday we will light one more candle in the Advent wreath, the increased light a sign that we are drawing closer to the anticipated event: the birth of our Lord. Christ truly is the centre of this great feast, and yet the narrative itself reminds us that we are all players in the story. At different times in our life we may identify with one character or another: the shepherds privileged to witness; the curious, intrepid foreign kings bearing gifts; the rejoicing angels; the simple animals sharing their crib; the humble mother and father. God’s plan, His great gift of salvation, has a role for them all. 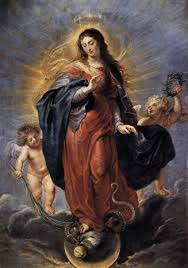 The Church is wise, I think, to give us the Feast of the Immaculate Conception now, just when we are focused on the coming of the Lord. The Immaculata shows us what is required in order to be Christ-Bearers, to bring Christ into the world, to make Christ present to those around us. She is the ultimate example of conformity to God’s will, of perfect obedience, of dying to self, of surrender, of being a fit dwelling for the Word of God. Yes, Mary is granted freedom from original sin, and we are not. But, however imperfect we may be, God makes grace available to us through the sacraments. That is no small thing! If we avail ourselves of that sacramental grace, we can begin to grow in holiness by increasing in virtue, by being able to surrender more of ourselves to God. Mary's model of meekness is not insipid, remember. She was a strong woman who spoke out when she needed to; the rest of the time, she let her Son do the talking. She was fierce in her love for her child, and I'm sure that fierceness extended to the disciples and greater community of followers. Saying yes to this awesome request God asked of her took a great deal of strength, too. So to be like Mary, we also must be strong when that is required of us. Here is something important. I want you to take this to heart: Mary would be the very first person to chide you for being too hard on yourself. When you tell yourself you can never be as holy as Mary, that you are nothing but a worthless sinner, and there's no way you are able to share Christ with anyone, Mary would hug you to herself and tell you to hush; that no child of God is worthless; that she loves you because our Father loves you. Then she would tip your head back so she can look you in the eye and say, "My child, you are beautiful. God has given you many gifts. Be brave. Be humble. Be obedient. I'm always right here for you. Now go." Because though we are flawed, we are still called. Pick yourself up, and carry on. God does not ask me to be Mary, He asks me to be me. Mary is an example of how to use God-given gifts in the service of God and neighbour: I can be obedient and humble as Mary is; I can carry the Christ Child in my heart. I, too, can be a sign of Love. O God, who by the Immaculate Conception of the Blessed Virgin Mary, didst prepare a worthy dwelling place for Thy Son, we beseech that, as by the foreseen death of this Thy Son, Thou didst preserve her from all stain, so too Thou wouldst permit us, purified through her intercession, to come unto Thee. Through the same Lord Jesus Christ, Thy Son, who livest and reignest with Thee in the unity of the Holy Ghost , God, world without end. Amen.